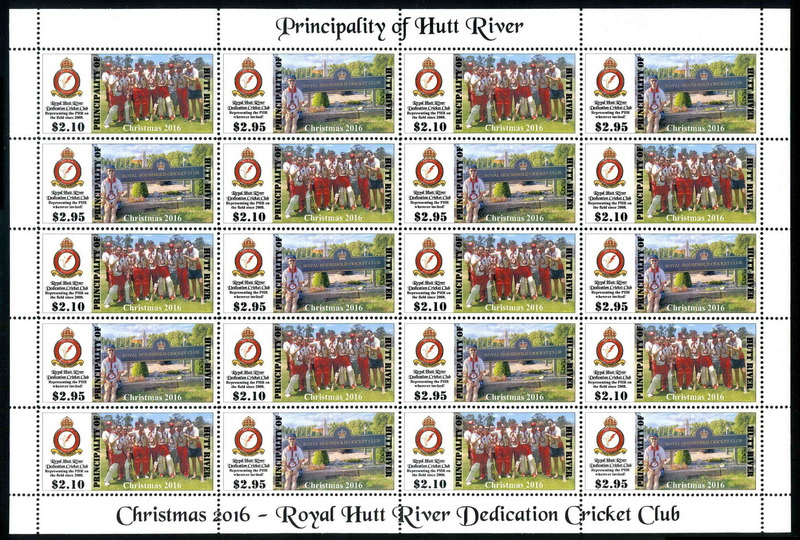 "Royal Hutt River Dedication Cricket Club"
the issue of its set of 2 Christmas 2016 Postage Stamps on 01 December 2016. This year's issue, commemorates the Royal Hutt River Cricket Club, the first sports representatives of the PHR to be featured on a stamp issue. The Royal Hutt River Dedication Cricket Club (RHRDCC) is the national cricket team of the Principality of Hutt River. by students of the Mildura Senior College. held annually in Mildura from the 27th to the 30th of December. "Royal Hutt River Dedication Cricket Club. " representing the PHR and its Sovereign. The $2.10 stamp features the RHRDCC team - Photo courtesy RHRDCC. Sir Geoffrey Pascoe KSOL. - Photo courtesy Ms Freya Shearer. against the Royal Household Cricket Club. You may come across our sportsmen and women all around the globe competing in all sorts of places. $2.95c Stamp features........."UK's Royal Household Cricket Club Ground"
Perforated Sheetlets consist of 10 sets in 5 rows of 2 sets of two stamps as se-tenants. 150 sheets, each sheet consisting of 10 sets of 2 stamps. Stamp, Cover & Card Design by: Lord Steven G.P. Baikie Earl of Tankerness, KGCRO., ADC. 150 sheets, each sheet made up of 10 sets of 2 stamps. Quickest & Easiest Purchase via email - "PHR On-Line"
Simply email, tell us what you want, we will return & confirm price and postage options!